In March, with inflation fears in a frenzy, we argued that the only way to “inflation proof” your investment portfolio was to take the hype as a warning for a sell-off. In March, we reminded investors that the oil rise “helped break the financial system in 2008. We look for it to happen again in 2011.” Our conclusion was to “urge investors to use this time to reduce risk, get liquid and secure your investment portfolio” (if they haven’t already done so). Interestingly enough, as the chart below shows, there is more leverage in the stock market now than before the collapse of Lehman Brothers. When valuations are high, this game of chicken ends up convincing investors to stay past the peak. The smartest investors sell when regular investors are piling in and the mania is at fever pitch. While George Soros was selling according to the WSJ, “day traders were going crazy.” If a trend ever gets to this level of excitement, cross it off your list if you are a buyer or sell if you already own, i.e. do what Soros does. If you haven’t already liquidated your portfolio of stocks, bonds and money market fund shares and moved to cash you are already late. Bill Gross, who runs the world’s largest bond fund and co-founder of PIMCO, is now 31% in cash - the most ever for the BOND fund. Jeremy Grantham, co-founder of GMO LLC (which serves institutional investors), wrote in his Quarterly Report published May 11, 2011: “the environment has simply become too risky to justify prudent investors hanging around, hoping to get lucky. So now is not the time to float along with the Fed, but to fight it.” His advice to investors is to have “extra cash reserves and patience.” Another sage, Jim Grant, author of the Grant’s Interest Rate Observer, has spent pretty much all of his entire career since 1983 railing against the weak dollar (and rightly so). In an April interview however, he believes that after a sharp burst of inflation a “terrific chaos in investment markets” will occur where “liquidity would come into its own very suddenly.” He is even forced to admit that U.S. dollars would become “precious and valuable”, while recognizing that he is in the “habit of disparaging them...because they are paper.” These paper dollars are needed by banks to hold against paper losses and for investors to pay down debts used in speculation. Since February, the 3-month T-Bill yield has moved back down to almost zero. We’ve already had our bout of inflation; the rush into cash is already on. We should expect a collapse of leverage. 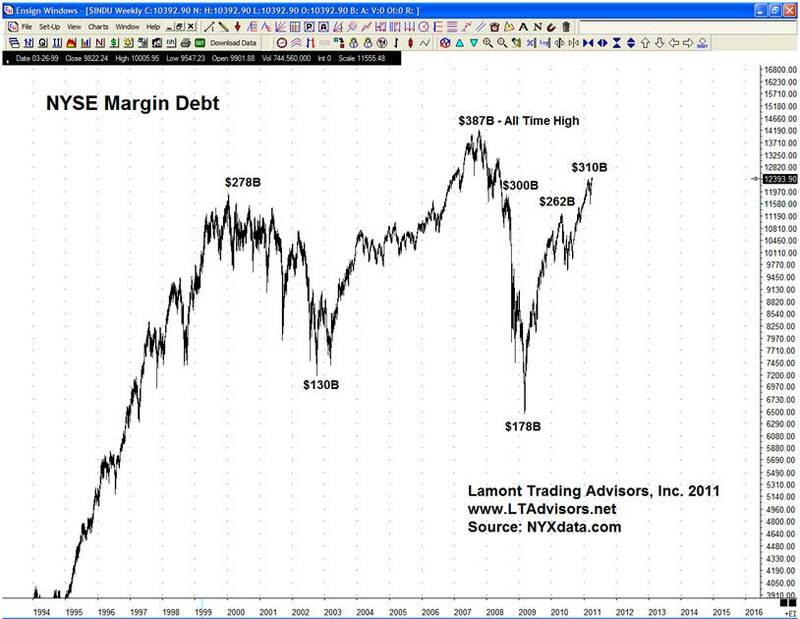 Full Disclosure: Paul J. Lamont holds a small S&P500 put option position. Copyright ©2011 Lamont Trading Advisors, Inc. Paul J. Lamont is President of Lamont Trading Advisors, Inc., a registered investment advisor in the State of Alabama. Persons in states outside of Alabama should be aware that we are relying on de minimis contact rules within their respective home state. For more information about our firm visit www.LTAdvisors.net, or to receive a copy of our disclosure form ADV, please email us at advrequest@ltadvisors.net, or call (256) 850-4161.